I am actually doing this right now. I enjoy knitting but I tend to do what is easy. This year I have been trying to improve on my knitting skills. I actually started in December when I made a lacy dishcloth pattern I saw on ravelry. That was challenging for me and I ripped it out and started over several times. I even researched and learned how to do a new cast on and how to kitchener (weave) the ends together so there was no obvious seam. After I was finished with that I was so pleased with myself and hungry to learn more. It helps to be part of a group that is doing the same thing. They might not all be knitting something challenging but there are always people more seasoned than you are that can offer a learning challenge. My group is a dishcloth group on ravelry called Dishcloth Weekly Knitalong. They are not just a knitting group though. They also have crochet patterns and there are several crocheters that participate. Each week they post a crochet pattern and a knit pattern and each person can choose which to work on. Many people do both patterns. Now a dishcloth group may not seem like the ideal group to learn new things and it wasn’t the obvious choice for me but after joining I learned the advantages of learning on a small scale. I am learning more challenging techniques but I don’t get so overwhelmed because the project is so small. If I had started out trying to make a lacy shawl instead of the lacy dishcloth above I might not have stuck with it long enough to finish. 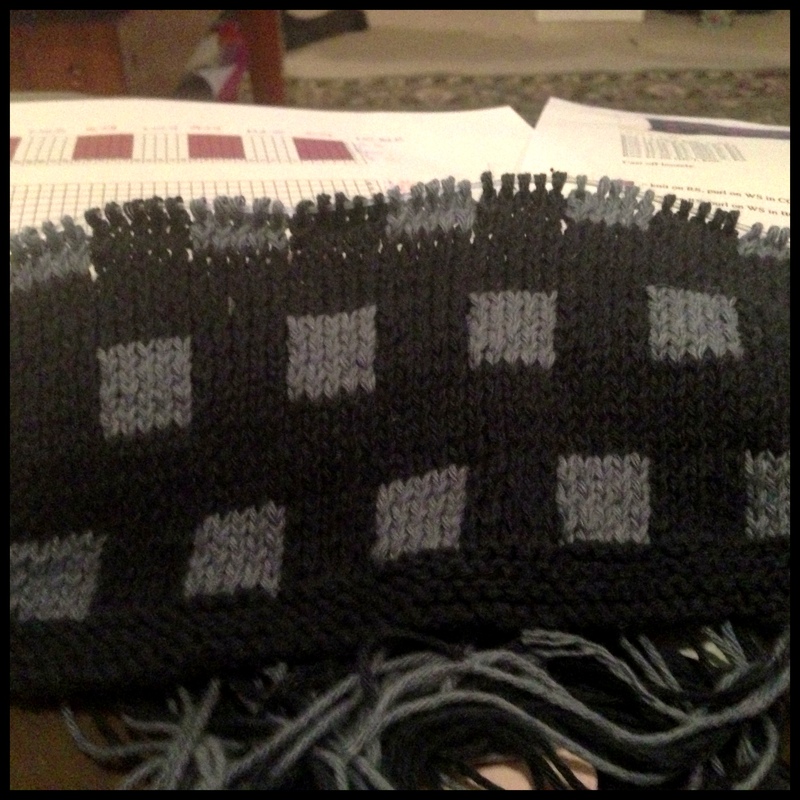 I am currently learning Intarsia knitting. This is a technique where you are adding blocks of color within larger areas of color without carrying yarn across the back. The pattern is a simple pattern with staggered blocks of one color on a different colored background. I have 10 bobbins of colored yarn dangling from my washcloth so the difficulty is not in the knitting but in keeping yourself from getting all tangled up. I am SO VERY GLAD I do not have a cat! Oh and I am using these bobbins that I printed free online from Wild Olive. I just adhered them to the side of a cereal box with Elmer’s spray adhesive and cut them out. I like the spray adhesive because I don’t have to worry about the layers of paper separating as I use them. They work great and they are really cute! 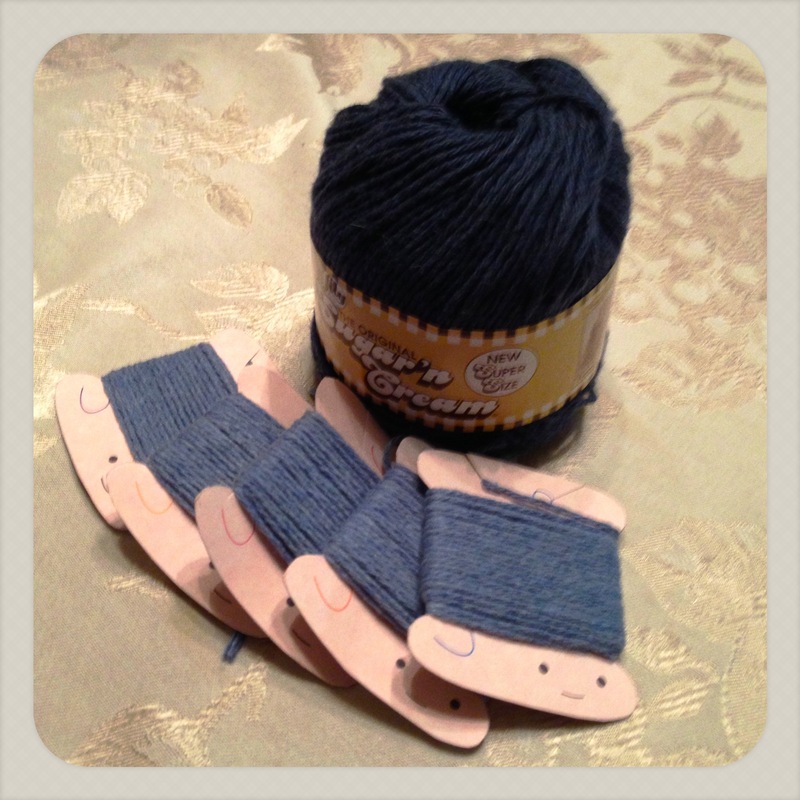 She also has smaller bobbins for thread on her website. I printed mine on pink cardstock and made some others on blue cardstock so I have boys and girls. I started out with my bobbins lined up all neatly in a row but that didn’t last long. At first I fought with them constantly tying to keep them all untangled. I finally just gave up and concentrated on knitting until I finished that section and then snipped them off leaving the ends to weave in later. It is so much easier if you just try to forget about the tangled mess and just knit but I’m a little OCD so it makes my blood pressure go up. I’m getting there though and it is not as stressful now as it was when I started. I am now about half way finished! This is the first pattern I’ve ever worked that involved a chart. So that is something new I’ve added to my repertoire already. I now know how to read a charted knitting pattern, at least a simple one. It really isn’t as hard as it seems. It is just more awkward. When you add in new threads it is very loose so you have to be careful of the tension. As you end one color you just pull the next color yarn under the old one being dropped so they get twisted. That prevents holes from forming in the knitted fabric. Even though some of the stitches are lose in the beginning you can just tug the lose ends in the back to snug them up and the front will all look like one smooth fabric. I love how it looks and even though this is a very simple pattern I can just imagine what could be possible! I have already found another pattern for a potholder using intarsia knitting and it has cute little chickens and eggs. I knew my sister would love it because she is crazy for chickens. I don’t get it really but that’s her thing and I’d love to make something I know my sister would love! I’m going to change the colors to match her kitchen. Here is my project at the halfway point. Lookin’ good! Here is a video I used to help me get started. It explains how to get started where most videos show you how to do it after it is about half way completed. When she first starts talking in the beginning it sounds really overly complicated. Don’t listen, just watch her do it and then go back and listen. It makes more sense after you’ve seen it being done. I only came here to see what Zemantic recommended I include in my daily prompt post, and found your unexpected and interesting post. I’ve done just enough knitting in the past to realize how good you are getting with your new skills. Congrats and keep up the good work! Thank you! I’m so glad you stopped by. I’m totally impressed with your knitting skills. 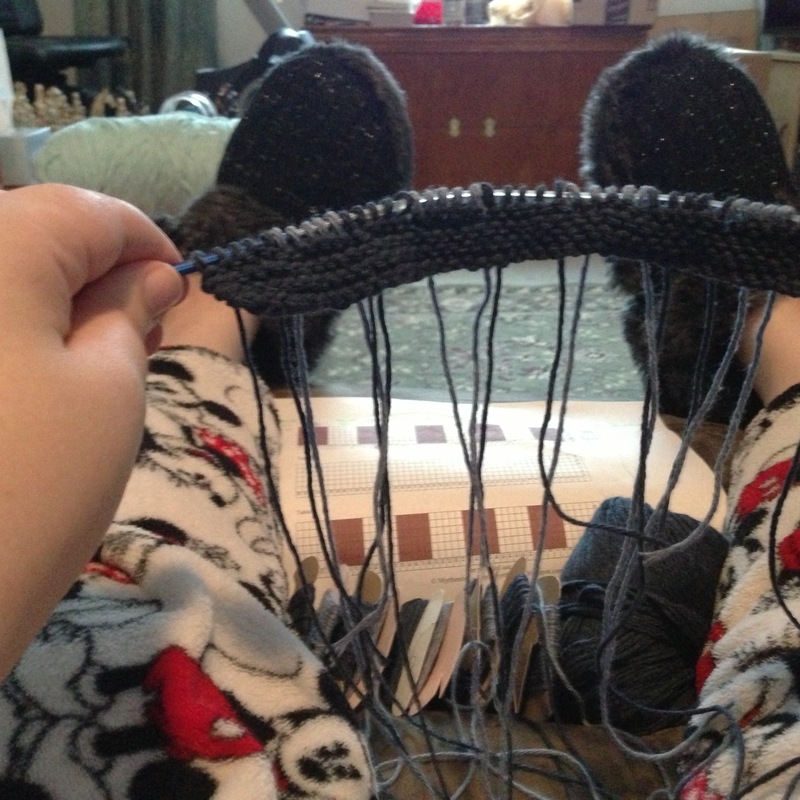 I tried to learn how to knit, but quickly got discouraged with it. 🙂 Many blessings on your knitting challenges!